Efficient design is suitable for use with low to medium power solar panels and solar arrays. Will work with most rechargeable battery types: Lead Acid (wet or gell), NiCd, NiMH and NiFe. Compatible with monocrystaline, polycrystaline and amorphous PV panels. Common Negative Ground for Solar Panel and Battery. Reliable solid-state circuitry, no power hungry relay with limited-life contacts. Built in fuse for short circuit protection, load circuitry requires its own fused disconnect. Capable of withstanding reverse battery and reverse PV connection. Charging method: Full-on below float point, chopper-stabilized PWM at float point. Temperature compensated float voltage set point for optimal charging at different temperatures. Radio quiet, can be used with sensitive radio receivers. High voltage transient protection on solar panel input for limited lightning protection. Simple 4 screw connector will accept spade lugs or wires for attaching a battery and PV panel. 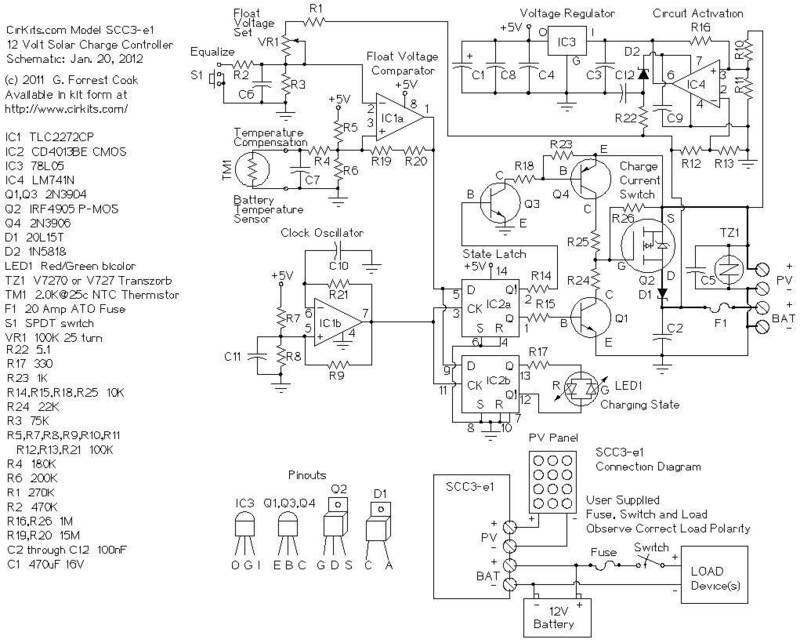 Multiple SCC3 units can be used to connect several (<20 Amp@12Vnom) solar arrays to one battery. Red/Green LED for Charge/Float state indication. Equalize switch for periodic maintenance overcharging. Float voltage adjustment trimmer pot. Solar Charging Current: 0 to 20 Amps continuous. Recommended Battery Capacity: 0.5 to 400 Amp Hours. Photovoltaic Panel Voltage Ratings: 12V Nominal (16-25V Open Circuit Voltage, 36 cell typical). Photovoltaic Panel Power Ratings: 1W to 240W (90ma — 20A Short Circuit Current). Voltage Drop During Charging: 0.5V @ 10A, 1V @ 20A. Float Voltage Adjustment Range: 13V-15V (range can be altered). Equalize Mode Voltage Increase: 1.5 Volts. Charge Controller Temperature Compensation: -7.5mV/Degree C.
Night Time Battery Current Drain: 0.8 — 1.8ma. Fuse Type: 20 Amp ATO automotive fuse. Board Dimensions: 3.5″ wide by 3.0″ deep by 0.95″ tall. Fits into a standard 4″ X 4″ electrical utility box, can be mounted on the cover plate. Board Mounts: 3X 4-40 screws on 1/4″ spacers. Assembled Weight: approximately 60 grams (2oz).